312 pages | 19 B/W Illus. 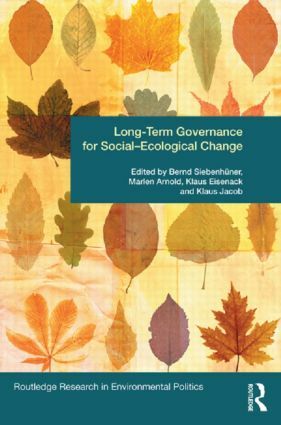 Bernd Siebenhüner is Professor of Ecological Economics and Head of the GELENA-research group on social learning and sustainability located at Oldenburg University, Germany. He is also deputy leader of the Global Governance Project at the Potsdam-Institute for Climate Impact Research (PIK) at the Global Change and Social Systems Department. Marlen Arnold is a Senior Research Scientist and Project Manager at University of Oldenburg, Germany, and a Lecturer at various higher educational institutions, notably in Finland and Colombia. Klaus Eisenack is Assistant Professor for Environment and Development Economics at the Carl von Ossietzky University Oldenburg, Germany, and heads the Chameleon Research Group. Klaus H. Jacob is a Research Director of the Environmental Policy Research Centre at the Freie Universitaet Berlin, Germany.